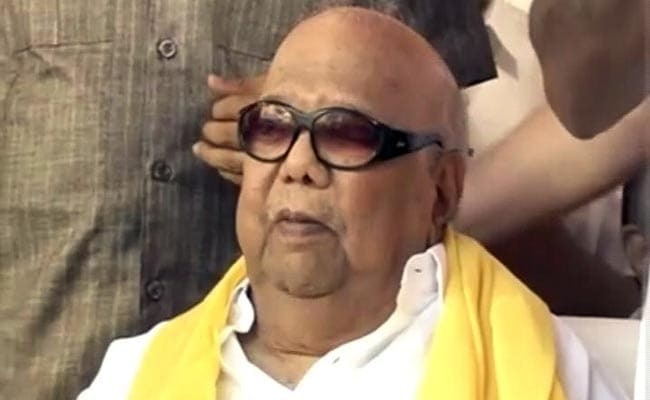 DMK sources also confirmed the meet, saying the two leaders are scheduled to meet at 12:30 pm at Karunanidhi's Gopalapuram residence. Chennai: Prime Minister Narendra Modi will be meeting DMK President M Karunanidhi in Chennai today, both the BJP and the DMK said. PM Modi is in Chennai today to attend the platinum jubilee function of a vernacular daily. "During his visit to Tamil Nadu today, PM Narendra Modiji will visit senior-most leader from the state and former CM M Karunanidhi," BJP national general secretary P Mualidhar Rao said in a tweet. The prime minister will also attend the wedding of the daughter of Dr TV Somanathan, a retired PMO official, at Raja Annamalaipuram. Mr Karunanidhi fell ill in October, 2016 due to a drug-induced allergy. In December last year, he was admitted to the Kauvery Hospital in Chennai twice. The veteran leader was admitted to the hospital for "optimisation of nutrition and hydration" in the first week of December and later, due to a throat and lung infection. He had undergone tracheostomy, a procedure to optimise breathing. Congress vice-president Rahul Gandhi had called on Mr Karunanidhi at his residence in December, 2016. The 93-year-old leader had made a public appearance on October 19 this year, the first since his illness, when he visited an exhibition in Chennai held to showcase the 75-year journey of DMK's mouthpiece, 'Murasoli'.